Your account notification preferences determine where and from whom you receive messages. Step 1: Go to the account settings tab of your user dashboard and log in. Step 2: Check or uncheck boxes under Notification Settings. For example, if you check the box with your phone number next to an organization but do not check the box with your email address, you will receive text messages from that organization but not emails. You can also add or remove an email address for any profile if you don't see the right email address on this page. You can only receive text messages at the mobile phone number on your account settings page. To unsubscribe from emails or texts for an organization, uncheck the boxes with your email address or phone number next to that organization under notification settings in your account settings. Uncheck all the boxes to unsubscribe from all direct messages. If you would also like to stop receiving team RSVP notifications, click on your team under the SE Bar to update your notifications. Important: If another member has linked your email to their account, they will need to unlink it for you to stop receiving messages. To enable text messages, first add your phone number then check the box with the number under Notification Settings. Step 2: Click Add Mobile Phone if your phone number is not already there. Step 3: Enter your phone number and click Submit. Step 4: Check your phone for the validation code. Step 5: Enter the validation code and click Submit. 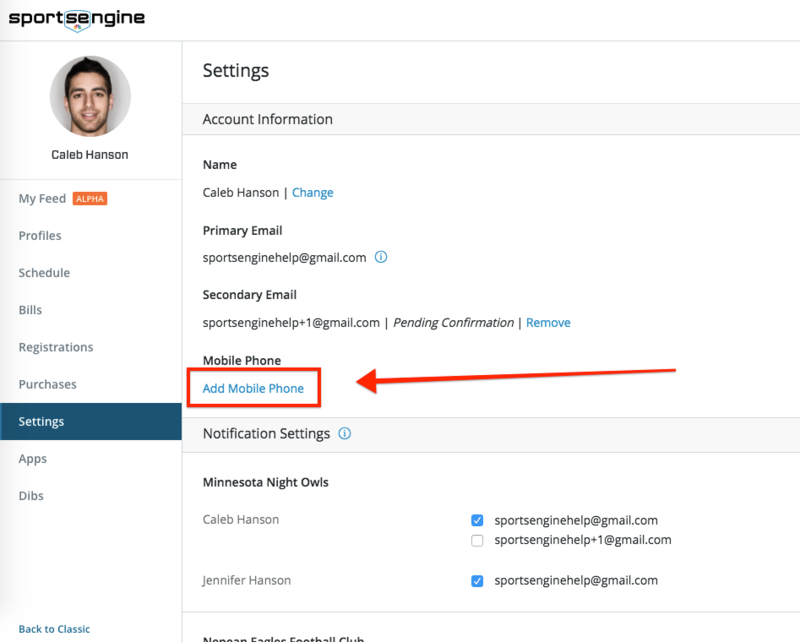 Step 6: Check the box with your phone number under Notification Settings.